Hortus Camdenensis | Salix viminalis L.
Fully hardy, fast-growing, upright shrub or tree with glossy shoots, slender, linear leaves, to 15cm long, and dense, crowded, green catkins, to 3.5cm long, in spring before the leaves. To 6m. [RHSE, Hortus, Hilliers']. A major source of osiers for basket weaving and long cultivated for this purpose. ‘The value of the Common Osier, for various kinds of basket-work, is universally known. There is a variety much esteemed, called the Velvet Osier, in which no external difference is discernible, but the twigs are said to be more pliant. There are also various species, as well as varieties, comprehended under the name of Osiers, some of which, having smooth leaves, are described in the earlier part of our first section. Others, generally of much less use, will presently follow. 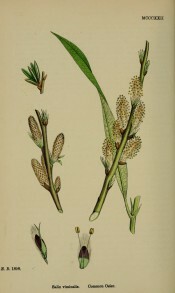 [The English Flora vol.4, p.229/1828]. That Rome would claim me for her own." The Druids are said to have formed huge figures of wicker-work, which on great occasions were filled with criminals and set fire to; but these baskets, according to Burnet and others, were made from twigs of the oak, and not of the willow. The Celtic Britons used the willow twigs, however, for constructing their skin-covered boats and shields. The present species of willow was cultivated in Holland from the first establishment of the herring fishery in that country in 1164, for the purpose of making hoops for containing salted herrings. Dr. Walker tells us that the Dutch boors, without any knowledge of the sexes of plants, selected for propagation those willows which appeared to be of the most vigorous growth, and thus unintentionally propagated only the female. As all the plants originally grown in England were obtained from Holland, we suppose the same must be the case in a great measure here.’ [English Botany vol.4, p.224, pl.MCCCXXII/1868]. Listed only in the 1857 catalogue [T.921/1857]. Macarthur was probably interested in its value for basket weaving, still important in the early Victorian era.